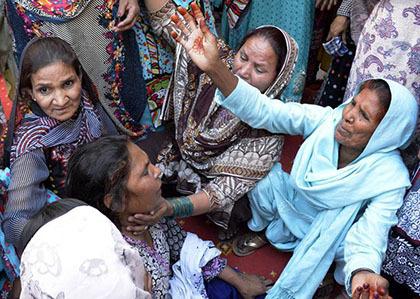 Pakistani women mourn the victims of March 27. Yesterday, more than 72 people including children were killed, and more than 200 injured, in a suicide bombing in Lahore’s Gulshan-e-Bagh. In a city and a country where the rich can afford private security to protect their families–they do not have to leave the comfort of their guarded homes to have Sunday picnics–Gulshan-e-Bagh was a garden for the rest of us. It is a place for those of us who cannot afford the luxuries of private security, and a space where we could bring our working- and middle-class families–our children, our partners, our parents and our grandparents–to laugh and to love in the open. Last night, our daughters and sons died, and so many of our loved ones are marred for life. There are no words for the dark loss of those who no longer have a mother or a father, a sister or a brother, a daughter or a son. Our hearts bleed for the dead and the wounded. PMLN (Pakistan Muslim League-Nawaz, the governing party of Prime Minister Nawaz Sharif) must realize the fact that this fire will also spread to PMLN’s Lahore! We have stood by for decades as the state and military have fostered Islamist forces to serve their personal and political ends within the domestic and the foreign sphere. We have stood by as the state and the army have consistently blamed “foreign powers”–be it RAW (India’s Intelligence Agency), CIA, or (the Israeli) MOSSAD–and turned the guns on our own people, putting the blame for problems they have created on the shoulders of the poor and the vulnerable, be they Pashtuns, Baloch, Sindhi, Punjabi, Siraiki, or others. The state and the military will use this attack as an excuse to further feed the cycle of violence, by pretending they are separate from the Islamist forces that they born and bred over so many years. This will be a mistake. We cannot allow the military establishment, their subsidiary militants and the parties of the far right to define and drive the agenda concerning the safety of our loved ones, and of the masses at large. It is time to carve out a new narrative of radical peace and equality from the ruins of our violent past. The Awami Workers Party is a left-wing party with some 5,000 members in Pakistan. It was formed in November 2012, as a merger of the Labour Party Pakistan, the Awami Party Pakistan, and the Workers Party Pakistan.